Sri Rounak Jewellery Equipments came into existence in the year 1999 as a business entity under sole proprietorship. It is located at N.S.C. Bose Road, Chennai, Tamil Nadu, India. The firm is acclaimed to be the leading manufacturer, supplier and exporter of a large range of jewellers’ utility machines and tools. 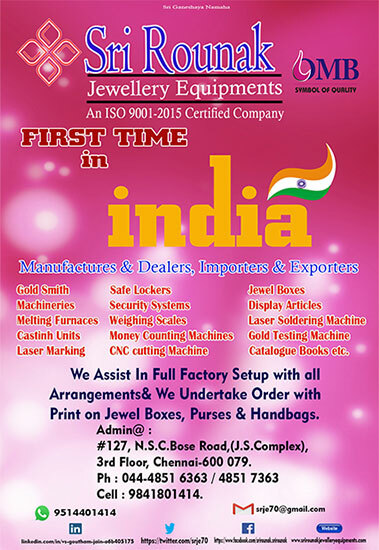 The product range comprises of Bangle Machines, Beading Tools, Casting Machines, Chain Making Machines, Cleaning Equipment, Drilling Tools, Engraving Machines, Finishing Machines, Jewellery Making Machinery, Melting Furnace Machines, Rolling Mills, Display Articles and more on Jewellery Catalogue. The sole proprietor of the firm, Mr. V.S. Goutham Jain with his master business skills and untiring efforts has leaded the firm to become the leader in the domain since 1999 itself. All activities right from purchase of raw materials to manufacture & fabrication, marking of products, packing and to final finish till delivery are taken care very strategically. The competence of our personnel is backed up by rich industry experience and vast knowledge of their domain.